As I reported yesterday, we woke up Saturday morning to a full blown Northeaster. To make matters worse, we were sitting just a few miles north of a Tropical storm packing Gale force winds. The WJAR weather lady couldn’t predict if we’d be safe or not. The good news was that the wind was blowing in just off the jetty to the east and protecting us from the waves. Despite the 35 knot winds, the chop hitting Vigilant was only a foot or two. Too bad it didn’t stay that way! The boat was bouncing around pretty good; too rough for Mrs. Horne to read. In light of this, I decided it would be a good idea to keep the crew off the boat as much as possible. Seasickness is a funny ailment that sneaks up on you, but once it sets in, it tough to shake it off. Did I mention how much I love Old Harbor and Ballards Marina? Everything is so close and pretty much anything you want is here. 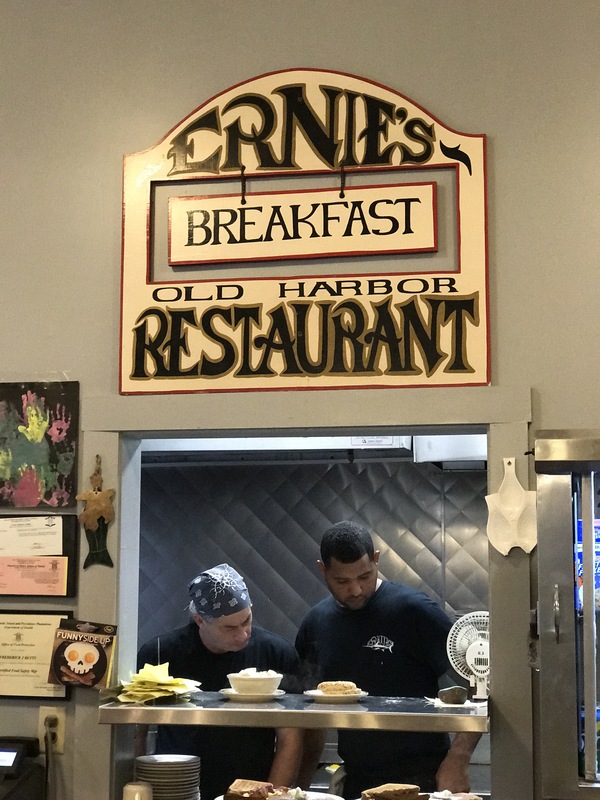 Ernies’s is about 1000 feet from the marina. A quick check with yelp showed 3.5 stars and Rudy spied a tasty looking omelet so that’s where we ate. I’ll do a full review later, but I can tell you everyone loved their breakfast. But top honors went to Gail’s Corned Beef Hash. 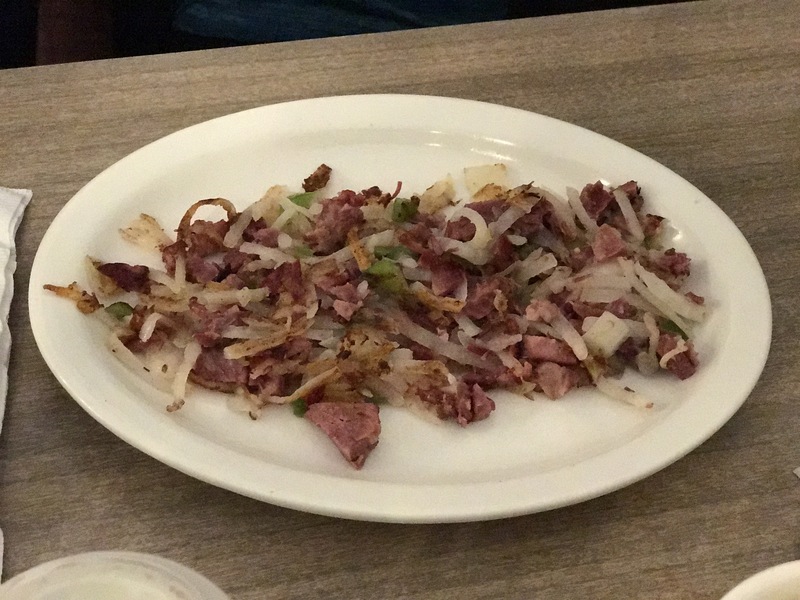 It was very fresh tasty, not mushy, and the sliced onions really made it sing. I’ll order it next time and get a runny egg on too! Knowing it was going to be high calorie day (hell its going to be a high calorie week), I suggested we take a walk across the island. I really wanted a tee shirt from The Oar at the Block Island Boat Basin, so I suggested that be our morning mission. It’s really a nice walk via the sidewalks until you get to Dead Eye Dicks. From there on you have to walk on the edge of the road and it’s a little scary as cars fly by. Mrs. Horne wanted to see if our friend from the 2016 trip – Captain Al and the Howlin Wolf was at the Boat Basin. He wasn’t in his regular spot, so I walked down the north most floating dock looking for him. No luck, but I did discover that the Boat Basin takes an even bigger beating in a Northeaster than Ballard’s. Not only were the boats bouncing wildly, but the floating dock was rolling hard from right to left. One more reason I was glad we were at Ballards! After a 2 hour and 15 minute walk, we’d built up quite an appetite. 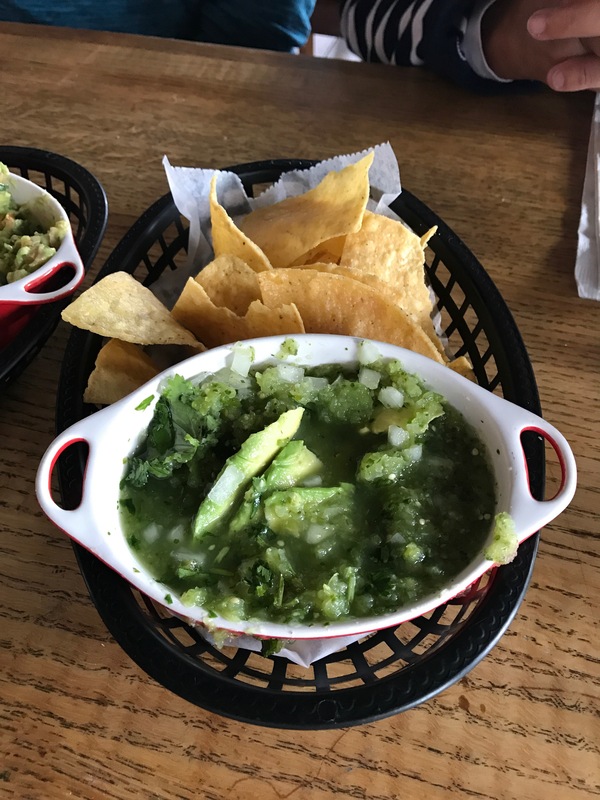 Breezy had told us that Caleveras served up great Mexican and yelpers concurred granting them a rare 4.5 stars. I also noticed it was BYOB so we put four ice cold beers in cozies and made the 1200 foot walk up the hill. I guess we were all hungrier than I realized as we all dove into our lunches before I thought to take pictures – so no review coming! Mrs. Horne had the Chicken Tortilla Soup, Gail and Rudy got White Fish Tacos, and I got a Carnitos Taco. All were fresh with layered flavors. The homemade soft corn tortillas were exceptional. Speaking of exceptional, the Blue Ribbon has to go to the Tomatillo Salsa. I did manage to take a photo! All was going nicely despite the increasing wind velocity. As we got back to Vigilant, I could see that the wind had turned fully to the north and the ocean waves were now coming head on. Vigilant was pitching significantly and the 3/4″ lines were stretching under the load. We went inside, but it was pitching too much to read. I put on a movie, but no one was really interested. About this time Mrs. Horne started to get nervous about everything. I went out to try and adjust the lines, but quickly realized I’d get soaked by the waves crashing over the float. Then she took off her boat shoes, rolled up her pants and went out to the end of the float amid the crashing waves. Rudy joined her and I manned the thrusters from the warmth and comfort of the helm. I kind of felt like Sig in Deadliest Catch watching the men haul in the crab pots! It turned out that they needed the thrusters. The load on the lines was so severe that they were stretched and cleated so tightly that it was impossible to undo them. Once we got repositioned the ride smoothed out. Both Breezy and Rudy were drenched in salt water. Breezy said something like “just doing my job” and walked away. Rudy Christened the Vigilant shower and gave it 5 Stars. No sooner did we get things buttoned up and the wind turned back over the jetty. It dropped to about 20 and the sun started to come out. We headed over to the Tap and Grille for dinner and a little music from Ethan Cash and caught the crazy scene there. After dinner we went to Ballards Beach to check out today’s venue. 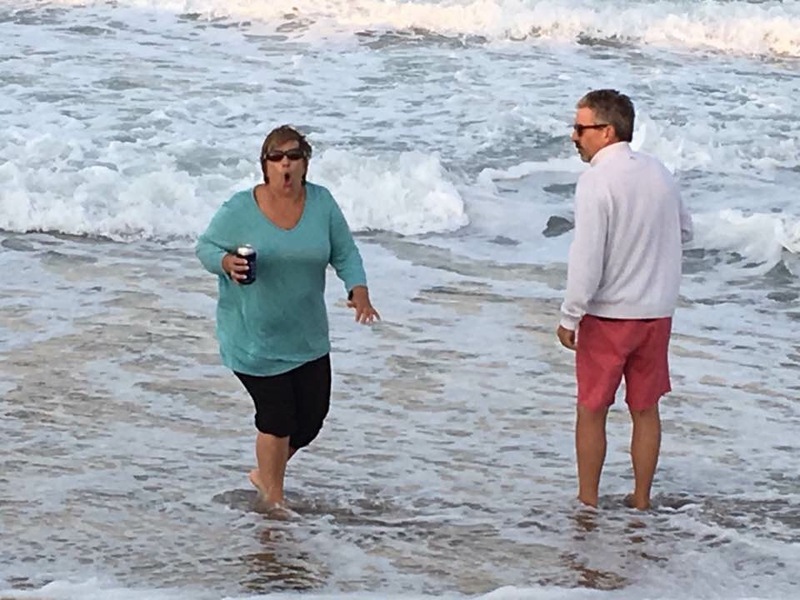 Gail and Rudy tested the water – it was cold!